Each of us associated with the grandmother most pleasant nostalgic memories. It's the kindest and beloved person! This means you needto buy flowers for grandma on a regular basis, even if there is no a special occasion, because she needs attention from your side! And if there is an occasion - you need to take care about the bouquet. 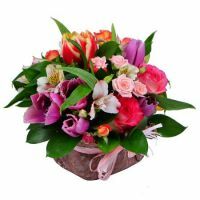 Grandmothers belong to another generation, so - to choose flowers for them, you should be treated especially carefully. Bouquet that you like does not have to be liked by her and it must be remembered. What kind of flowers to give grandmother? As a rule, people are beginning getting older to appreciate the simpler, everyday things which young people do not notice them. This also applies to grandma - she will certainly be more than happy to ordinary bouquet of wildflowers than the huge, gorgeous armful of roses. Simple, plain bouquet reminds her of her youth, when she gave modest flowers, but with deep meaning. And those moments are worth much more than expensive luxury flowers, which she will get more trouble than joy with.